In two weeks, I will be participating in a panel discussion at the 2014 AECT International Convention. with four incredible scholars: Drs. Vanessa Dennen, David Merrill, Charles Reigeluth, and Wilhelmina Savenye. I thought I would write out some of my thoughts on the future of the ID programs in this blog post and will share these thoughts in the panel discussion. We have seen a major shift in the last several decades to the knowledge society, and with this shift comes a change in the skills and competencies required. And because instructional design is very clearly knowledge work (what could possibly more knowledge work that the design of learning and instruction? ), our designers must develop and gain these competencies. Our ID students must be gain the following skills. How well do we teach these abilities in our programs? 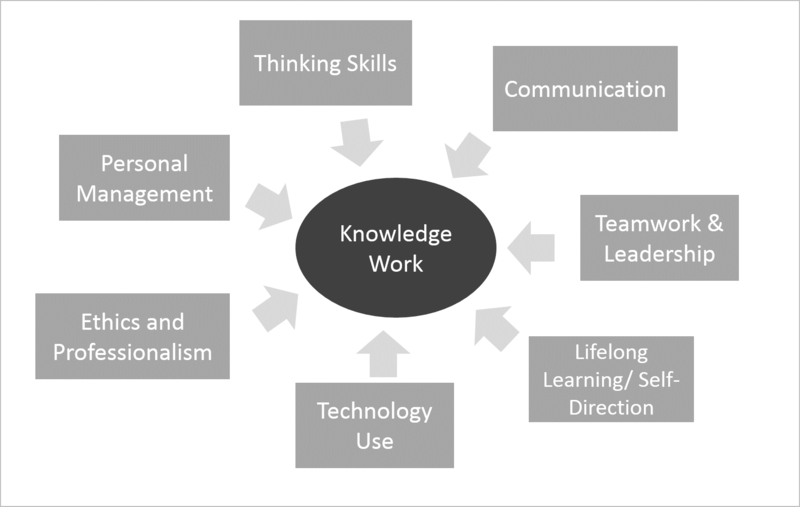 I am not stating that instructional design programs do not teach some or most of these competencies, nor should they necessarily teach all of these skills and competencies. However, we should think about how our instructional design programs fit within the context that requires these abilities. As I have spoken with managers of instructional designers over the last several years, a common complaint is that instructional designers often want to operate in a manner that is disconnected from the organization in which they work. There seems to be a struggle on the part of the designer keep their art and science - as learned in graduate school - intact and pure, without influence from the organization in which the work is taking place. Defending their turf in this manner can keep instructional design work entirely disconnected and irrelevant to the organization in which the work is taking place. We must help students see that design must align with the role and purpose of the organization which it serves. Students must gain knowledge on how their performance fits into the performance of the entire organization. They must also understand how to adapt what they are doing to fulfill the needs of the organization. Remember that work in the knowledge society is interdisciplinary and varied, and sticking to regimented (even antiquated) ID strategies without adapting to the organization's needs is not sustainable. Students must, therefore, gain the ability to see the big picture of the organization. The highly related field of Human Performance Technology can provide students with this capacity and can also give them many tools for effectively supporting the organizations in which they work. Many instructional design program graduates end up managing trainers and instructional designers. However, in their training they appear to receive little training on how to effectively manage those individuals in their work. Our ID programs should give our graduates the ability to manage projects, a vital piece of effective instructional design. Instructional design projects are often complex, requiring the coordination of multiple employees, processes, and technologies. We must provide our students with the capacity to manage, organize, and manage large projects effectively. In addition to project management capacities, our students must gain skills in management and leadership. They must develop the capacity to motivate and direct the work of those they lead. In higher education, instructional designers are specifically well positioned to lead because of the collaborative, systematic, design-oriented nature of ID work. We may (or may not!) agree that the three major tools of the instructional designer are (1) theories, (2) technologies, and (3) processes. These tools will continue to change as the nature of our work changes, and I note the following questions and comments about these tools. Do the theories we espouse and teach in our programs help learners gain the competencies required for success in the knowledge society? Do they enable independent learning and problem solving? Do they enable learners to achieve internal motivation and the attitudes necessary for a successful career? The concept of "instruction" seems to imply the delivery of detailed information about how to accomplish a task. Perhaps we are still teaching our students to design in ways that are more directive in nature. There is and will always be some need for this, but our designers must also know how to teach their learners "how to fish" instead of simply "giving them a fish?" Technology options will like continue to grow, and they will also continue to become easier to use. As they do so, what will separate us from an individual with no formal understanding of instructional design concepts? As a field we need to be able to demonstrate that we are relevant and add value based on our knowledge. Our students must also be willing to continually adapt to the technological needs and preferences of the learner. While I have a great deal of confidence in the general process of instructional design (ADDIE), We must teach our students the importance of continuous improvement. The competitive environment in which we work requires increased efficiency, and designers must be able to analyze, change, and improve the design processes they use. The integration of HPT into ID programs will likely assist in making this shift more effective. In addition, design processes must enable IDs to create appropriate learning solutions while still maintaining efficiency and quality output. The balance will be difficult to find, and designers must know how to work toward that balance. Well, I look forward to the panel discussion. It will be great to hear the ideas of the other panelists, and I hope I can contribute to the conversation.